I use short tele lens as my main lens when I'm taking nature photographs. I use it to all kind of purposes from close-ups to lanscapes. Typically in everything else than landscape photography the foreground and background can not be sharp, therefore it's very important that bokeh is good quality. For actual macro shots I prefer to use Canon EF180mm f/3.5 L USM since it offers more working distance and more magnification. Based on photos I have taken I have no reason to doubt that the measured MTF charts would not be as Zeiss has them measured. Performance is perfect even wide open with 1DmkIII. Also this lens will keep delivering once I update to full frame camera, according to Lloyd Chambers it resolves Nikon D3x 24.4Mpix sensor in extreme corner of frame at f/2 easily. Generally bokeh is very "Zeiss"-like in this lens; smooth and lively at same time. Optically worst fault in this lens is LoCA (Longitudinal Chromatic Aberration) in bokeh. It's not as bad as with Canon EF85L f/1.2 L USM mkII, but the magenta and greed fringes outside focal plane may be very visible and impossible to remove. If you shoot subjects which have tendency to produce LoCA (e.g. photographing cars with lot of chrome, which is in bokeh) NOTICE! LoCA exists only in bokeh, not in focal plane! This lens handles back light situations very well - I have no hesitations to shoot at any conditions with this lens, I can have confidence that Makro-Planar delivers. When I have taken night photos, in which strong light sources are in frame, I have not seen any flaring. Practically this lens is flare free. Also I have not detected any sort of veiling flare. Wide open lens has pretty strong vignetting. It's less serious at high magnifications, but it's pretty bad at infinity. However in practice landscapes are not shoot at f/2, but this limits usage of the lens in some applications, for example photographing stars. Vignetting in almost gone by f/4. I have not been able to notice any distortion when shooting with the lens. This matches well with the distortion graphs Zeiss has published. Aperture is can be selected 1/2 stop intervals. When using viewfinder and manually stopping down it's easy to calculate "clicks" from wide open to determinen the aperture into which lens is stopped down. Only problem with setting aperture is that the lens barrel is quite wide (wider than aperture ring) and aperture ring is between lens barrel and camera and in some situations it wasn't easy to adjust aperture, specially with gloves. Lens hood protects front lens element very well physically and quite well from sun and other light sources which could cause flares or decreased contrast if allowed to shine to front lens element. Zeiss lens caps are not very good to operate and I have replaced them with Nikon lens caps with have better design. Polarizer is quite difficult to operate when hood is attached to lens. Hood protects filter quite well from sun and other light sources. However when filter is used 1/3 of it's exposed to lights source if light is coming from angle that it barely reaches outer 1mm from the front lens element. 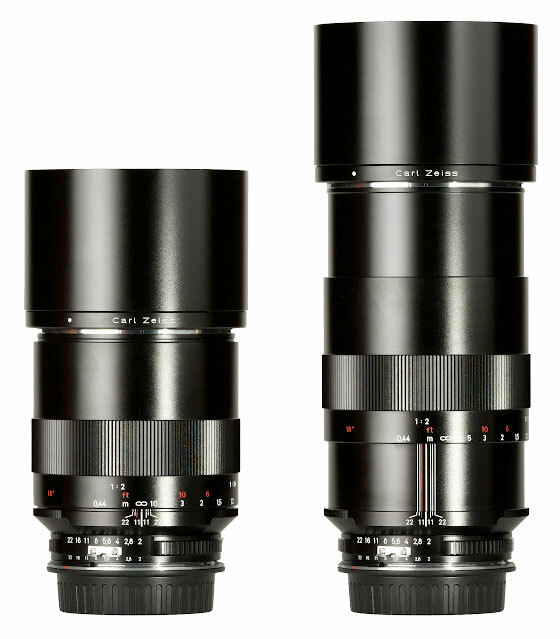 Lens dimensions with Nikon to EOS adapter and lens caps are: diameter 76mm, length 116mm, weight 720g. Dimensions when including hood: diameter 82mm, length 162mm and weight 780g. Length from EOS lens mount with hood is between 145mm and 199mm. This lens isn't internal focusing and therefore extends when focused closer. 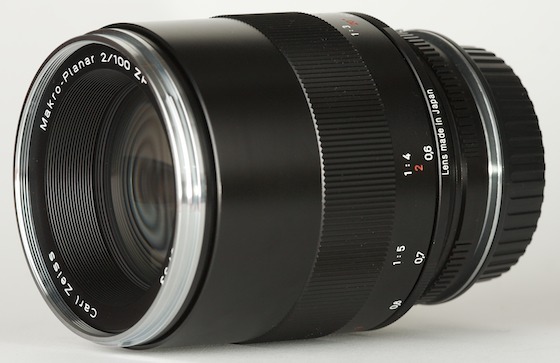 Lens extends about 44mm when focused to minimum focus distance 0.44m. Lens uses weird filter size of 67mm, I don't use any other filter than Circular Polarizers and I didn't even have this size yet. Minimum aperture is f/22. Aperture has 9 blades and aperture remains very round even at f/22. Lens has 9 elements which are in 8 groups. Actual focal length is 97.5mm. Minimum focus distance is 0.44m, which results 1:2 magnification and full frame (36mm x 24mm) coverage of 72mm x 48mm. On 1.3x crop camera coverage is 55mm x 37mm and in 1.6x crop 45mm x 30mm. 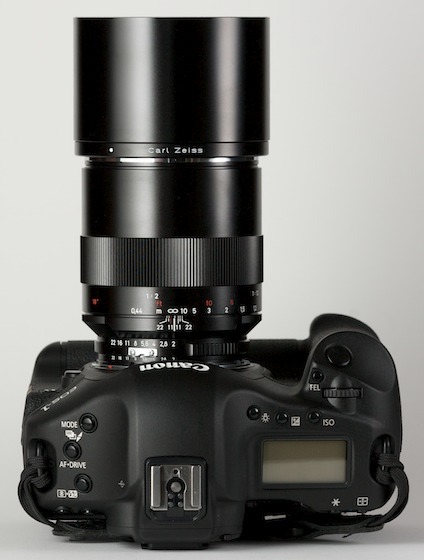 Distance from EOS lens mount (including adapter) to end of the hood is 145mm at infinity and 199mm at 1:2. As you can see from photo aperture ring is not easiest to access, at least with gloves on freezing temperatures.